Cook the potatoes in a pot of well-salted water until they are very tender but not mushy, 15 to 22 minutes. Drain well. In a large mixing bowl, whisk together lemon zest and juice, rosemary, salt, pepper and hot sauce. When the salt is dissolved, whisk in the olive oil, mayonnaise and mustard. Add potatoes to the bowl and mix them very well, until well coated with dressing. Then use the spoon to mash about a quarter of them. You want 1-inch (or so) chunks of potatoes coated in some mashed potatoes. Add scallions and parsley and toss well. Taste and add more salt, lemon juice, hot sauce and olive oil, if needed. 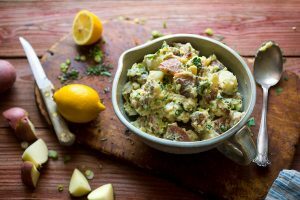 Scatter chopped basil or dill over dressed potatoes. Serve warm or at room temperature, but not cold. Break the head of cauliflower up into chunks and cut into desired sized pieces. Add all the cauliflower to a microwave safe bowl and cover bowl with damp paper towels. Microwave on high for 3 minutes. Re-dampen the paper towels and microwave for another 3 minutes or until cauliflower is fork tender. 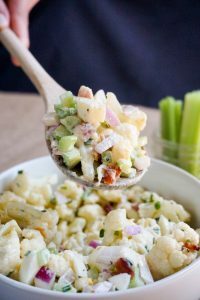 Dice the bacon, hard boiled eggs, celery, red onion and chives and add it to the bowl of cauliflower. In a separate bowl combine the mayo, mustard, apple cider vinegar, salt and black pepper and then pour it over the cauliflower mixture. Combine the entire mixture thoroughly with a spoon and add any additional salt and pepper as you see necessary. Store in a sealed container in the fridge up to one week. Serve cold and enjoy! Soften the vermicelli noodles in a large bowl by covering with boiling water and soaking for 3-4 minutes or until tender. Rinse under cold water, drain, and add to a large bowl. 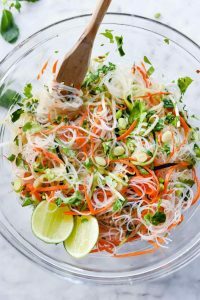 Add the shredded carrots, cucumbers, bean sprouts and chopped cilantro to the noodles. In a glass jar fitted with a lid or a bowl, mix together the fish sauce, rice vinegar, sugar, garlic and crushed red pepper. Pour ¾ of the dressing over the noodles and toss to coat. Add more dressing if desired. Sprinkle with more cilantro and green onion and a squeeze of lime if desired. 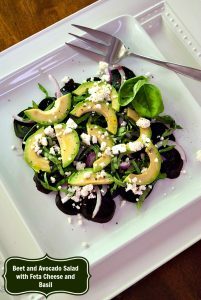 Salad can be made ahead and refrigerated overnight, however if making ahead, add the cilantro just before serving. Add ingredients to Blendtec jar in order listed and secure lid. Select “Dressing” and serve. 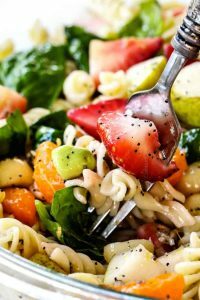 The dressing tastes best when you refrigerate it overnight in a sealed container – the ingredients are allowed to marry together. Salt and pepper the insides of your romaine lettuce halves. Sprinkle olive oil on the halves, if you wish. Add to hot grill or grill pan and cook for about 1 to 3 minutes tops. Flip to grill the other side for 1 to 2 minutes and you’re done. 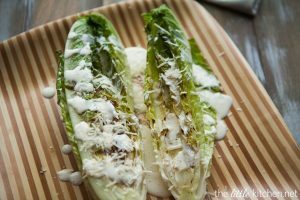 Serve immediately with caesar dressing and parmesan cheese on top. *Store the dressing in the refrigerator for about a week. 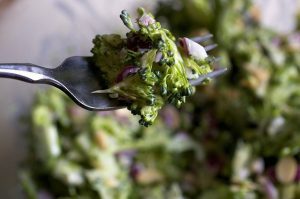 If serving as a side salad, one whole heart can serve up to 4 or 5 people. 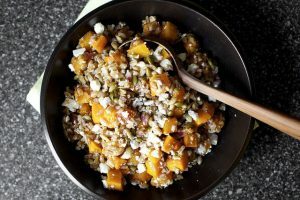 Preaheat the oven to 425 degrees.Combine the farro with 4 cups of water in a medium saucepan. Bring to a boil, then lower the heat and simmer for 25-30 minutes, until the farro is just cooked. Drain and pour into a large bowl. Whisk together the lemon juice, vinegar, garlic, 3 tablespoons olive oil, 1 teaspoon salt and 1/2 teaspoon pepper. Pour over the hot farro and stir well. Meanwhile, place the red pepper slices on a half sheet pan and toss with 2 teaspoons olive oil and ¼ teaspoon salt. Roast for 20 minutes, turning once halfway through. Set the peppers aside to cool slightly. Add the cucumber, tomatoes, red onion, roasted peppers, parsley and olives to the bowl with the farro. Stir until combined, then gently fold in the feta. Serve at room temperature. 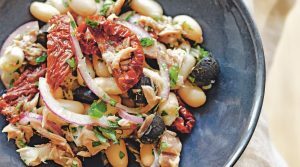 Put the tuna, beans, tomatoes, anchovies, onion, olives and parsley together in a bowl. Season well with salt and pepper. In a teacup, mix the olive oil, mustard and lemon juice together. Season and check to see whether your balance of lemon to oil is good – remember you are going to add this to something very starchy so it needs a bit of tang. Pour the dressing over the bean and tuna mixture, being careful not to squash the beans. Taste for seasoning and adjust as necessary.